Rev. William Grant, Pastor of the Tribeca Spiritual Center and Co-Chair of the Lower Manhattan Clergy Association, was a guest speaker in the Seminary's "World Religions and Global Conflict" class on September 9th. Rev. Grant, whose congregation was dislocated by the attack of 9/11, spoke about his ministry and the controversy surrounding the proposed Islamic Community Center and Mosque at Park 51. Rev. Grant, an ordained American Baptist, noted that he came to Lower Manhattan as a church planter. Energized with the vision of organizing a large, dynamic Christian congregation, he made strides following his Easter 2001 launch. However, 9/11 led him to realize that "my picture of ministry was not God's picture." Rev. Grant came to understand that he was "called to minister to an area that was broken by this terrible attack, economically, spiritually, emotionally, and physically." Specifically, he set aside the mega-church model of ministry and committed himself to "a vision for interfaith peace and understanding." The Tribeca Spiritual Center now includes among its leadership team, Jews, Christians, Sufi Muslims and representatives of Native American traditions. As a clergy person in Lower Manhattan, Rev. Grant has had immediate involvement with the "Ground Zero Mosque" controversy. During the time they were dislocated, Rev. Grant's congregation met in the Sufi Bookstore and mosque run by Imam Feisal Adul Rauf, the leading proponent of the Park 51 Islamic Center. Rev. Grant met personally with Sharif el-Gamal, the principal of SoHo Properties which purchased the site. He also spoke out in favor of the center at the Lower Manhattan Board meeting which overwhelmingly approved the project. Rev. Grant with Rabbi Jonathan Glass of Synagogue for the Arts is scheduled to meet with Imam Feisal to propose that a "School for Peace" be part of the community center. Rev. Grant emphasized he is not an "advocate" for the Cordoba Project. However, he affirmed their right to build and stated that he "stands for the right of people to express themselves in a religious manner." He opposes a "litmus test" whereby Muslims prove themselves to be "moderate" by "taking their beliefs and all they stand for and going away where they won't bother anyone." According to Rev. Grant, "No prophet whom anyone remembers today did that." Prophets, he said, "stand as engines of transformation, saying I am in ministry in this time and place ... here is the message that God put in my heart so I can be an instrument of change." Inspired by Rev. 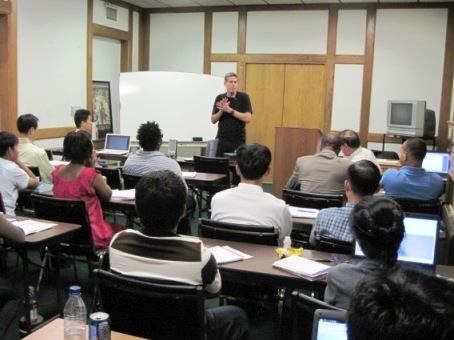 Grant's visit, fourteen participants from UTS joined Rev. Grant in a "Liberty Walk" organized by Religious Freedom USA on Sunday, September 12th. Approximately 1000 persons took part in the walk which began with speeches at St. Peter's Catholic Church, a block north of Ground Zero. Speakers included from Katherine Henderson, President of Auburn Theological Seminary, Rabbi Jeremy Kalmanofsky of Congregation Ansche Chesed and Charles Wolf, a businessman who lost his wife on 9/11. The walk proceeded down Broadway, turning on Liberty back towards the World Trade Center. In front of Ground Zero, participants walked in silence, paying respect to those who were killed. Following the period of silence, marchers turnd up Church Street to Park Place, where all gathered in sight of Park51, blocked off from public access, to sing the National Anthem and "This Land is Your Land."